Here's Christine Smallwood's review of No Simple Highway, from the January issue of Harper's magazine. It tails off at the end as she segues to the next book of interest. There were dozens of hippie acts in Haight-Ashbury in the late 1960s, but most people have only heard of a few: Jefferson Airplane, Santana, Janis Joplin, and the Grateful Dead. At the time, Jefferson Airplane was the most commercially successful, and the Dead the least. The Dead never had a Billboard number-one single, though the Library of Congress eventually declared “Truckin’” a national treasure. Shakedown Street went gold, but nine years after its release. They toured for thirty years, but didn’t become the top-grossing band in North America until 1991, their twenty-sixth year together. Why? That’s the question behind Peter Richardson’s new book, NO SIMPLE HIGHWAY: A CULTURAL HISTORY OF THE GRATEFUL DEAD (St. Martin’s Press, $26.99). Jerry Garcia’s own explanation was cute—he said the band was like licorice: not everybody likes it, but people who like it really like it—but hardly enough to satisfy a historian. As you might expect from the author of books about the Bay Area radical magazine Ramparts and progressive intellectual Carey McWilliams, Richardson’s story of the Dead is a story of the Sixties and its aftermath. One strand of the Sixties, anyway, whose benchmarks include Ken Kesey and the Merry Pranksters; Woodstock and the Summer of Love; the Whole Earth catalog and the Whole Earth ’Lectronic Link (WELL) bulletin board, which spawned digital communities of Dead Heads as well as Wired magazine. By the time of 1995’s Tour from Hell, this version of the Sixties was a marketable commodity, and Bloomingdale’s had sold hundreds of thousands of $28.50 neckties from the J. Garcia Art in Neckwear collection. The good people at St. Martin's Press forwarded this review of No Simple Highway from Kirkus, the book review magazine and website. It will post online December 15 and appear in the January 1 issue of the magazine. Far-ranging look at the ultimate jam band in the acid-drenched context of their formative years. Richardson (Humanities/San Francisco State Univ.) opens his account, fittingly, with a look deep within the pages of Aldous Huxley's The Doors of Perception, a book that "recounted a single day in the life of an English intellectual tripping on mescaline in and around his Hollywood home." 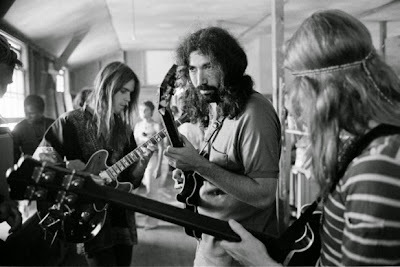 Intellectual, hallucinogen, California: Voilà, the ingredients of the Grateful Dead, a band born in the heady Bay Area coffeehouse, bookstore and Beat poetry heyday. Richardson wisely locates the band within that tradition, allowing for lashings of British Invasion pop and old blues and for the particular eccentricities the region has always permitted. The author ascribes much of the culture change of the 1960s to the Dead's discovery that, if they were the weirdest of all the guys in Frisco, there were plenty of like-minded weirdos around the country. In the days before the Internet, connecting with those people and building communities required constant touring, and so the band also became as known for its dedicated work-shopping and endless roadwork as for its devotion to the lysergic arts. It's now more than half a century since the band began to form, so one supposes that it's necessary, as Richardson does, to explain who Ed Sullivan was and why Harry Smith's folk anthology was so important to the nascent counterculture. 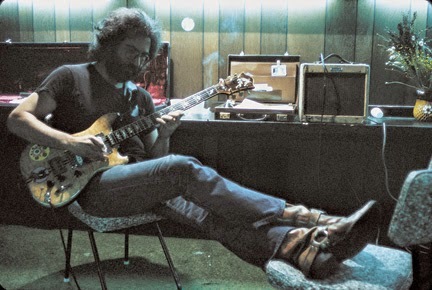 Along the way, the author raises such important matters as the ascent of Ronald Reagan, Jerry Garcia's opposite in nearly every respect, and the role of the Dead as both cultural interpreters and cultural pioneers, a role that is very real, no matter what one might think of hourlong jams on variations of "Johnny B. Goode." Not quite as smartly conceived and written as Greil Marcus' Invisible Republic (1997), but a kindred book that helps locate an influential musical group in time and place. I admire and drew from Greil Marcus's Invisible Republic (aka The Old, Weird America), and though I think the two books' aspirations are different, I wouldn't dream of denying the kinship.